Wesleyan’s Center for the Humanities, one of the oldest humanities institutes in the United States, celebrates its 50th anniversary this year with a focus on the ways “the human” has been figured over the past half-century. The Center evolved from the Institute for Advanced Study, founded in 1959 as a place where visiting scholars could pursue research and writing projects. 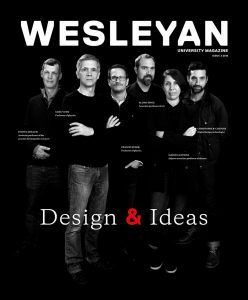 Ten years later the Center assumed its current name in a reorganization that expanded the community of fellows to include Wesleyan faculty and students. Since then, the Center has maintained a consistent mission of promoting innovative, interdisciplinary teaching and research, with an emphasis on sustained conversation between the humanities and social sciences. The anniversary theme of “Figuring ‘The Human’” poses a series of questions pertaining to our understanding of what it means to be human and how that has been shaped by globalization, biotechnologies, postcolonial critiques, poststructural theory, revolutions in communications, and experimental art forms. Included in the figurings of the human to be examined is the extension of human functions through biotechnologies, new understandings of human capabilities such as sleep and numeracy, representations of mutants and cyborgs in the past and present, and various boundaries of human kinds and between humans and animals. As a visual representation of the theme, the Center has selected an image from the Davison Art Center Collection. Shown at the left, this color woodcut, Untitled (Foundation Print) 1995, with collage, was created by Kiki Smith (American, born 1954) and was acquired through funds donated by Caroline M. Macomber, trustee emeritus.